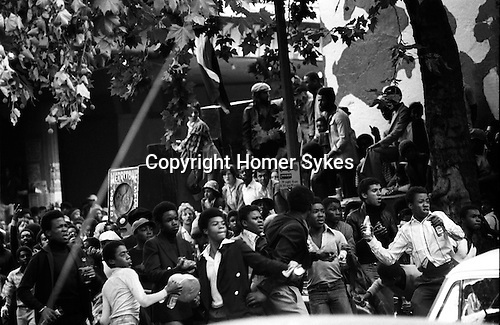 The Notting Hill Carnival started in 1966 and was a low-key local Caribbean community event. By 1976 as many as 150,000 people were attending. In the late afternoon, at the north end of Portobello Road near the Westway flyover violence erupted after police officers attempted to arrest a group of pickpockets working the crowd. Running skirmishes developed that led to a full scale riot. Bricks and bottles were thrown, by both black and white youths; the police were woefully unprepared and defended themselves with amongst other things dustbin lids. 160 people were hospitalised, there were over 60 arrests.